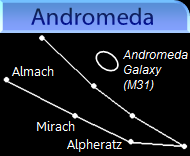 ANDROMEDA is a v-shaped constellation and is the first constellation in alphabetical order. 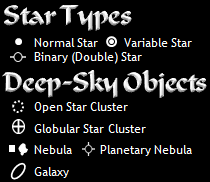 The brightest star in the constellation is Alpheratz; the magnitude is 2.06. Andromeda is famously known for having the Andromeda Galaxy, which is the nearest spiral galaxy to the Milky Way galaxy. To learn about the Andromeda Galaxy: click on the "Galaxies Page" tab.